Al Gaudet will very rapidly find the family in Chatham et Ottawa Ontario . Following this, the Canadians will prepare a trip to France so as to accompany the family to the cemetery in the Haut Nistos. They planned to come over in early July 1999. 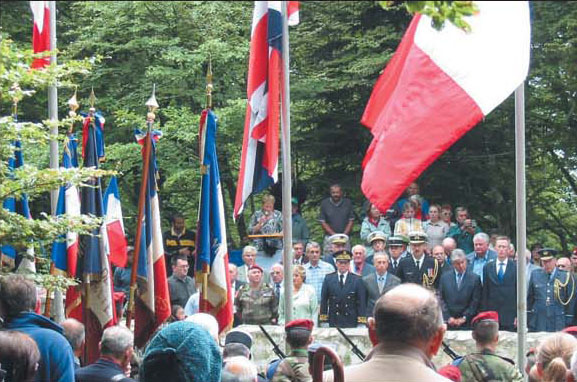 The Prefecture of Tarbes organizes ceremonies atop the Pic du Douly in their honor. 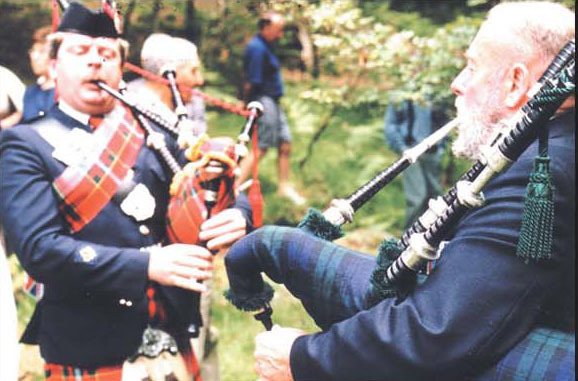 On Wednesday February 25 and Tuesday April 28 1999 it was decided that there would be 2 ceremonies at the cemetery. - A private one organized by the Canadians on July 9. - An official one organized by the Prefecture on July 10. A 40 strong Canadian delegation arrived at the Tarbes airport on Monday July 5 and was welcomed by Mr. Fadat , the mayor’s deputy. 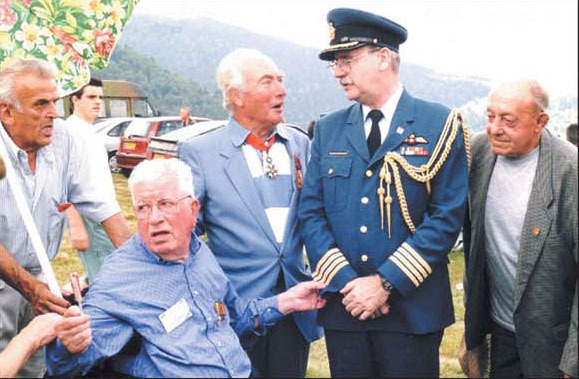 The delegation was led by Mr. Pickard, the delegated Minister of Defense, accompanied by DGL Pearson, the Chief of Protocol History and Heritage of the 1st Air Division (CFB Winnipeg) and by the Grand President of RCL 28 Colonel Lawson. The private ceremony of July 9, with the inhabitants, the mayors of Nistos and Sacoué and the veterans of the Résistance was very moving. The ceremony of July 10, and the speech of Shawn the grandson of the aircraft commander . When he spoke he really struck the assembled gathering really when he spoke of the feelings of his grandfather that gave his life , far from home and to defend freedom. These words of thanks for their hospitality and having maintained the cemetery keeping alive the memory of his grandfather and his 6 comrades buried with him struck a deep cord in the assembled crowd of Nistos. On July 10 at the end of the ceremony a meal for 200 guests was served at the community hall of Nistos. 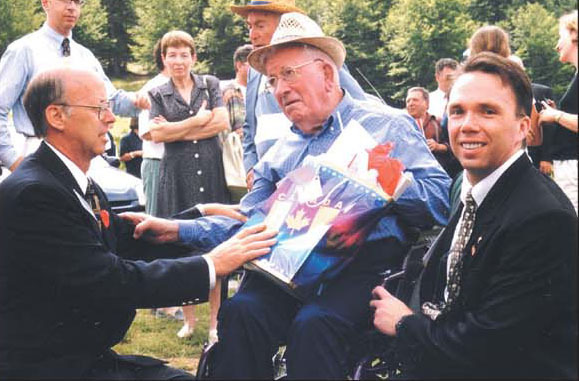 The Canadians offered many gifts to all the dignitaries. 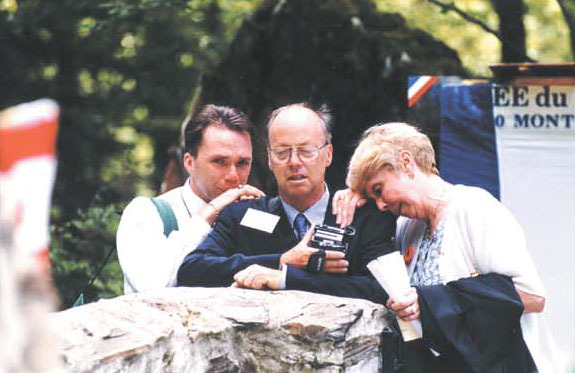 An emotion filled moment, when the Peers family arrives at the cemetery on July 9 1999 at 10H . The son accompanied by his wife cannot contain their tears. They find where the Pilot Officer met his death and rests in peace after 55 years. Leslie Arthur PEERS converse avec André Bordes. Shawn PEERS, petit-fils de l’officier pilote du halifax. 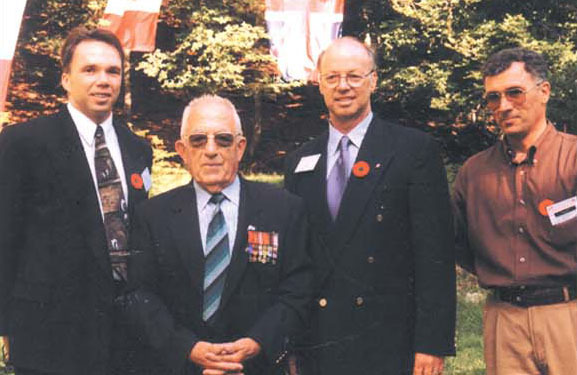 From L to R. Julien Plantat former Résistance fighter, son of Plantat who created the Maquis de Nistos, Bordes André, Louis Cabau, Colonel Desrochers Military Attaché of the Canadian Embassy, Louis Nasare leader of the 15 Résistance fighters who buried the aircrew on July 18 1944. 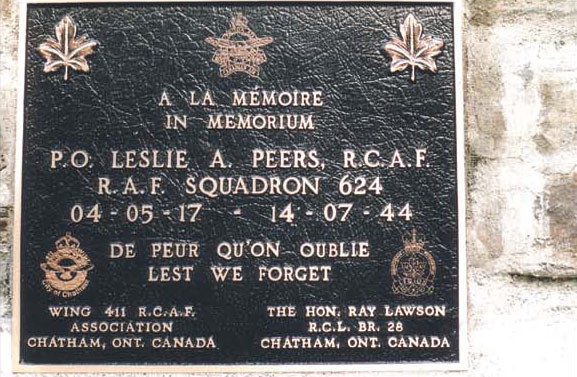 Plaque in memory of Leslie Arthur Peers of the RCAF, given to Mr. Jean Bordes. It will be set in place on the stele by him and François March of Montréjeau on August 1st 1999. 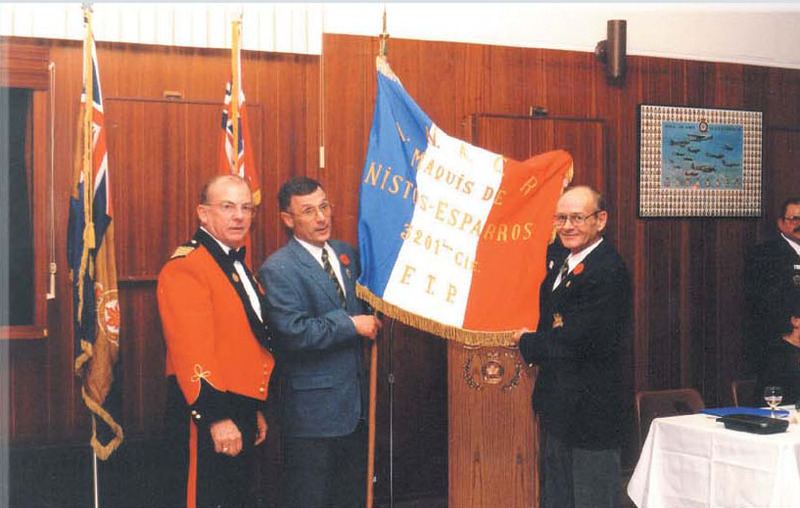 Plaque in memory of the airmen of RAF 624th Squadron given to Mr. Alain Gaudet and then handed over to Mr. Jean Bordes. It will be set in place on the stele by him and François March on July 7th 2004. 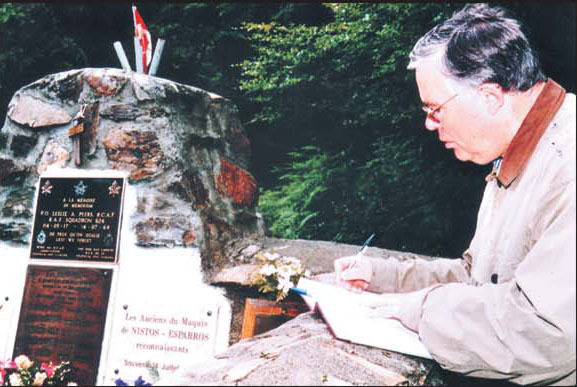 Mr; Johnson, Director of the Commonwealth War Graves Commission during his visit to the cemetery ,signing the guest book on July 11, 2000. To inform visitors a plaque has been put up on the wall of the cemetery. It explains the tragedy of July 13 19944, when 7 airmen of the RAF/RCAF died . It also talks about how the cemetery was renovated in June/July 1994. 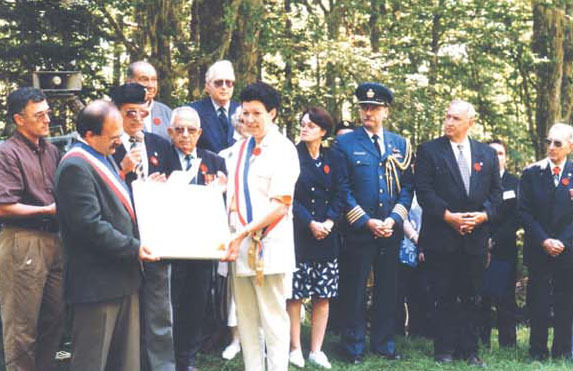 This plaque was paid and realized by the Association des Anciens Combattants de la Résistance (the ANACR … association of French Résistance veterans ) of the Hautes-Pyrenées. The text was written by Mr. Fernand Perebosch a veteran of the 3201 FTPF de Nistos et Esparros. 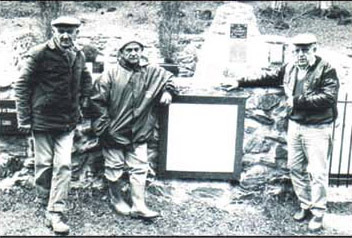 The plaque weights in at 40 kilos and was transported up the mountain and forest to the cemetery on November 9 2000, with the help of a stretcher by Mr. Lucien Pomian, Mr. François March and Jean Bordes, all 3 of Montréjeau. 7 airmen of the Royal Air Force rest in peace in this cemetery. 1 Canadian Pilot Officer and Commander of the aircraft and 6 British crewmembers. They died here on the night of 13/14 July 1944 when their aircraft crashed here. The Halifax aircraft came from Algeria, its mission was to parachute weapons to the Résistance Fighters of the 3201 FTPF. 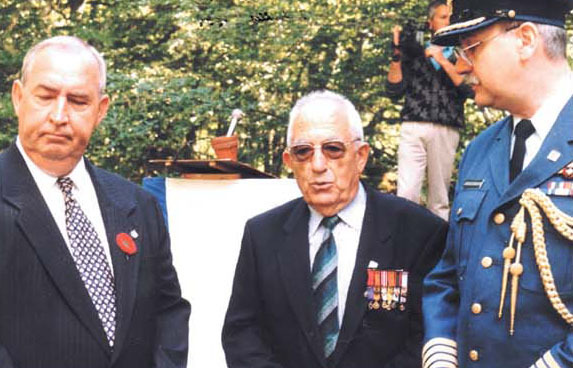 They were buried in secret on July 18th 1944 close to the wrecked aircraft by the Résistance fighters of the 3201 FTPF and inhabitants of Nistos and Seich , they were lead by the primary school teacher Mr. Lucien Rumeau. 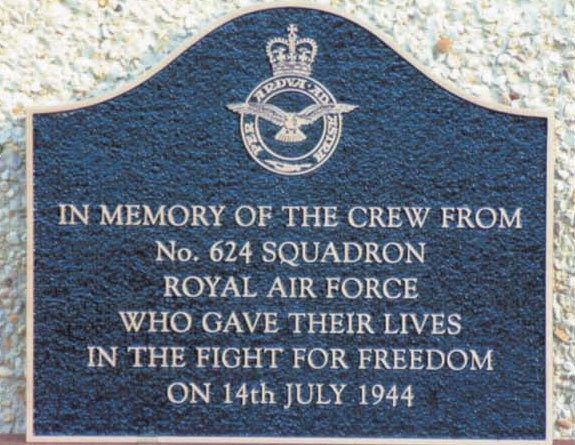 In 1954 they offered a plaque that has the names of the airmen. 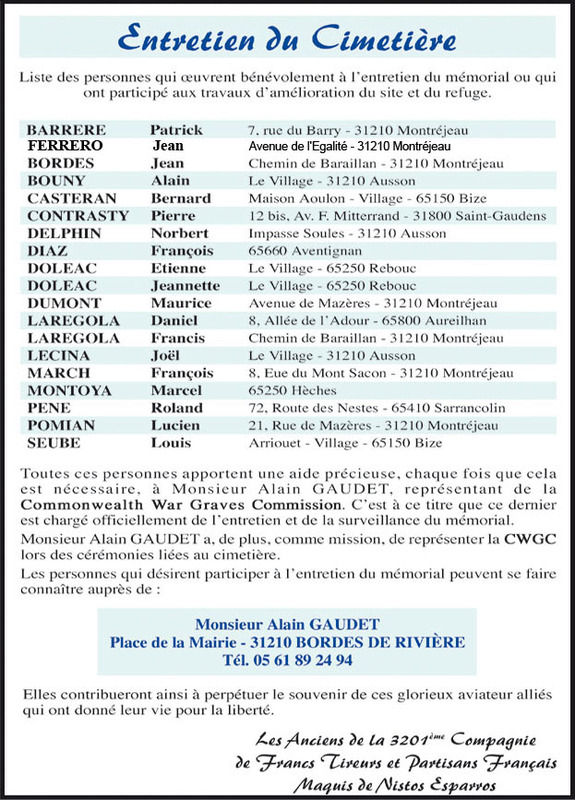 In 1994 the cemetery was renovated in accordance with a project laid down by Mr. Norbert Delphin, a teacher at the Technical High School of Gourdan and by Mr. Jean Bordes, a veteran of the 3201 FTPF who prepared and directed the building of the memorial. One must mention in particular Louis Torres and Jean Cebollade former members of the 3201 FTPF. Alphone Juanola and Fernan Garcia of the Souvenir Français; Francis Larregola and Patrick Barrere of Montréjeau. 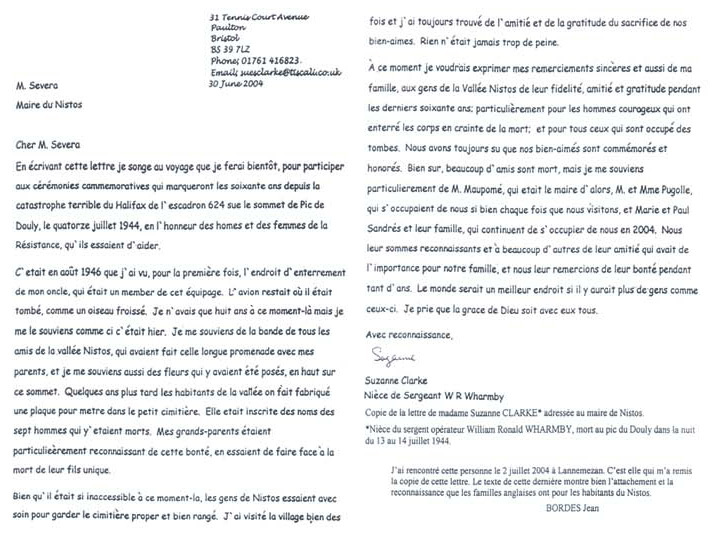 The Souvenir Français has participated financially to this project. 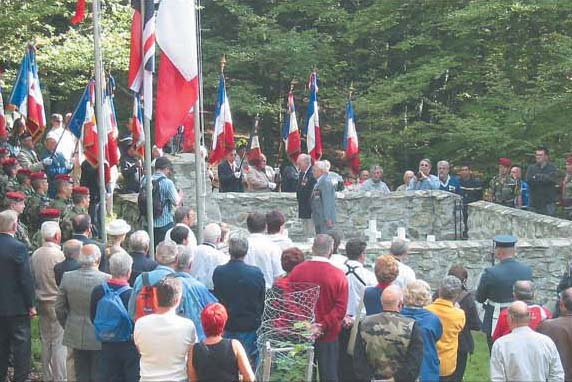 The cemetery was inaugurated on August 27 1994 by André Rumeau the Mayor of Sacoué, were also present many dignitaries one of which was Mr. Roger Virnuls, Honorary Consul of Great Britain and 32 flags of various patriotic associations (of veterans). 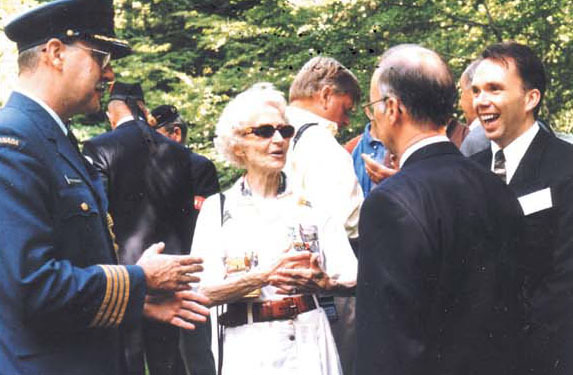 In 1998 the family of Leslie Arthur Peers in Canada was informed of the resting place of the Pilot Officer. 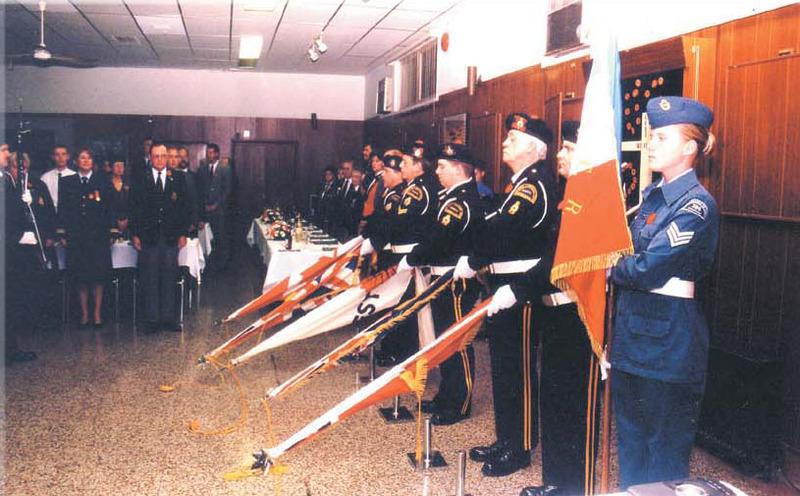 Since 1944 he was considered as M.I.A..
British honor guard presenting arms. The dignitaries at the beginning of the ceremony. Mr. De Clarens the Président of the Comité Départemental of the Résistance of the Hautes Pyrénées representing around 20 associations lays a wreath. 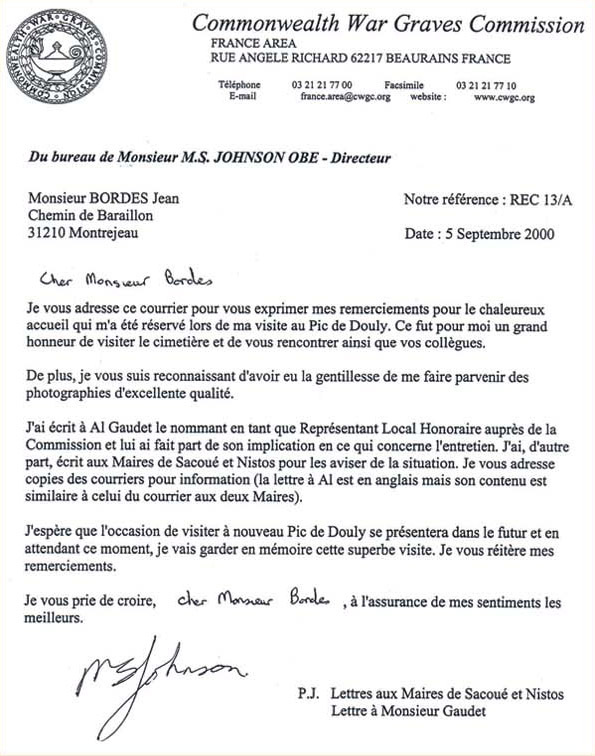 He is accompanied by Mr. Jean Bordes who represents the former Résistance fighters of Nistos and Esparros. 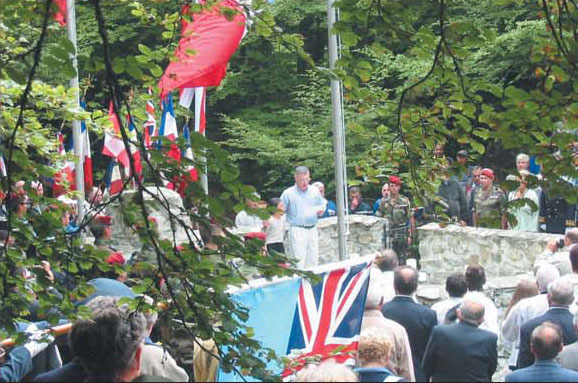 On July 11, 2000, Mr Johnson, the Director of the C.W.G.C France area visits the cemetery and made it known that a Tribute at the Pic du Douly in early July 2004 would be organized so as to commemorate the 60th anniversary of the death of these RAF/RCAF airmen. 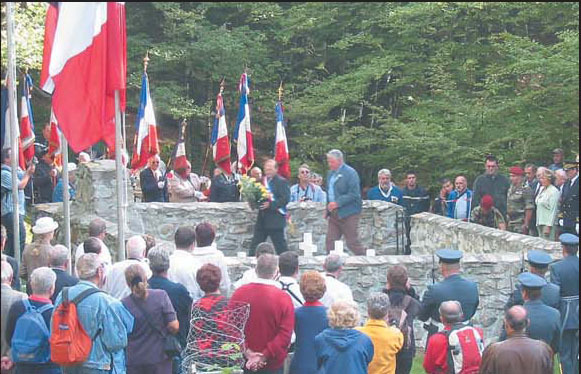 The City Hall of Lannemezan will be responsible for the planning and organization of the ceremonies. 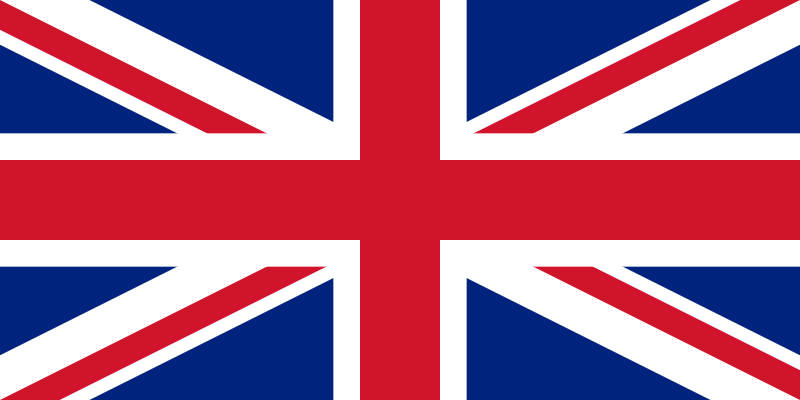 The representative of the Commonwealth asked that they take place on July 2 and 3 so as to not come into conflict with the Bastille Day ceremonies in France. 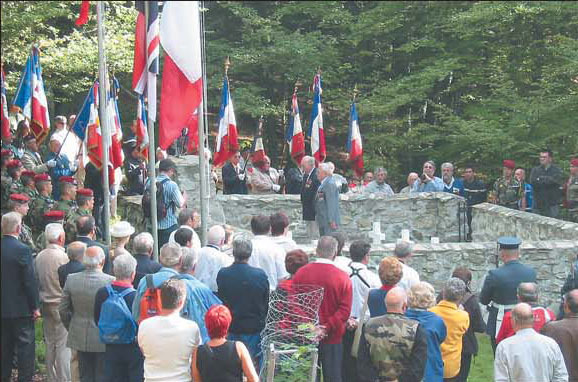 A working group has been set up and is in charge of all the planning and organization; it is made up of City Hall authorities, the department’s military authority, veterans, former Résistance fighters of the Hautes-Pyrénées, Flight Lieutenant Gary Vickers RAF 4624 Squadron of RAFB Brize Norton and representatives of the Maquis of Nistos and Esparros. Planning this ceremony will take 7 months of work. - The housing in Saint-Gaudens and Tarbes of all these guests as well as their transport plan to attend the many different ceremonies. 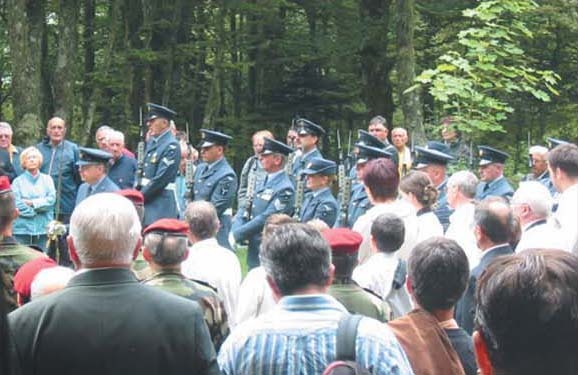 The City of Lannemezan’s technical services will arrange various installations for the nigh time ceremony of July 2 and for the ceremony of July 3, at 12:30H at its war memorial monument. The community hall was set up to welcome 200 guests for the noonday meal. The aperitif was also prepared for all who attended and participated in the ceremonies. - 3 flagstaffs of 6 meters in height and removable pulleys plus ropes. - setting up the flagstaffs cement support base, these flagstaffs having to be brought down after the ceremony due to high winds and snow at this altitude. 11 volunteers from the Aure and Nistos valley participated in these endeavours. Because of the high number of elderly people and elderly veterans of the RAF who were not accustomed to walking in the mountains, the oldest being 91, precautions were taken for their safety. 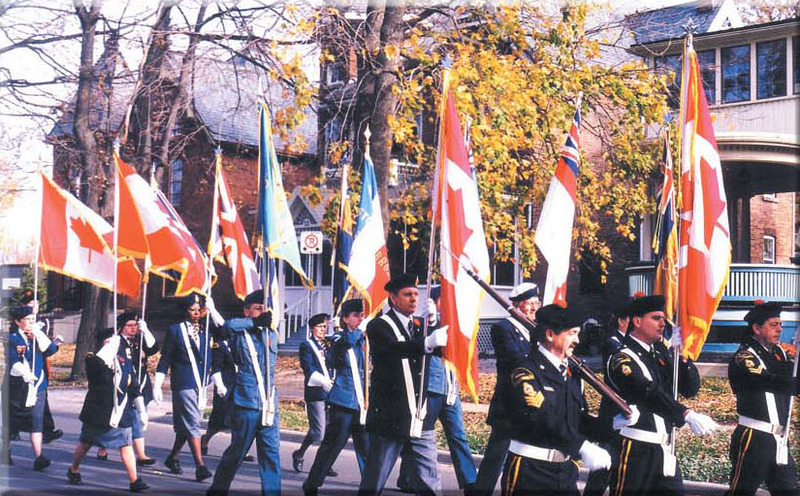 To avoid unfortunate incidents Colonel Paul Pécheur willingly organized all the Red Cross staff for this ceremony. He will set up an impressive and organized Red Cross group that will indeed impress the British participants. All these ceremonies were a success thanks to Mr. the Colonel BOMETON and Madame Stocklin who were the Master of Ceremonies. At the end of the meal at the community hall the Commonwealth authorities gave superb gifts to the many important guests and former Résistance fighters.